As the winter is slowly starting to settle in it what’s better than a backyard BBQ to remind you of all the sweet summer days that have come and gone. 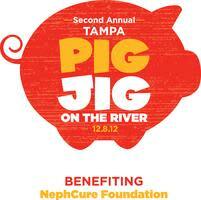 That’s right ladies and gentlemen the 2nd Annual Tampa Pig Jig is upon us! Pig Jig was created last year when a group of extraordinary men joined together to raise money when they found out a close friend of theirs had been diagnosed with FSGS, Focal Segmental Glomerulosclersis, a debilitating kidney disease. All the proceeds of this delicious and entertaining event will go to the NephCure Foundation, which is the only organization that is exclusively committed to seeking research for the cause of this disease and Nephrotic Syndrome. For those of you brave enough to put your secret sauce on the line there will be a BBQ competition, live music, and fun games! The benefit will be held at The Heights on December 8 and will run from 12- to dark. Tickets are available to purchase at http://tampapigjig.eventbrite.com/#. General Admission is $10 if purchased in advance and $20 the day of the event. VIP Admission tickets are also available for $100 and include food and drinks provided by Pappas Ranch. Come out and support this great event and don’t be afraid to get jiggy with it! Stay tuned in for more updates on things to do in Tampa Bay!